A few weeks ago now I took an oath, the oath is called "The Oath Of The Neophyte". The Neophyte is the first grade/level of those who practice The Golden Dawn tradition of ceremonial Magick. As I have had years of experience with ritual work through different Witchcraft covens, in which I became initiated to the level of High Priest. A lot of the rituals on the Neophyte grade are familiar to me as some traditions of Witchcraft borrow rituals from ceremonial Magick. Gerald Gardner and his involvement with Freemasonry and the Rosicrucian's, who later went on to founder the Gardnerian tradition of Witchcraft might be in part responsible for this. One example of this would be calling the guardian Angels of the Watchtowers in the 4 cardinal directions. However the difference between the two is that in ceremonial Magick there is much more detail involved. I feel that no matter how much experience someone may have in regards to esoteric matters. On working with new systems of Magick, it should always still be started at the beginning. With myself, I find that rather than staying with one tradition, teaching, system, method. I include what I have already learn`t over the years and blend it all together. This is the benefits of working solitary, where as in a group the groups tradition would have to be used. The Oath Of The Neophyte is not like a pact but more like a commitment or dedication before the higher powers that the person taking it will except what is required at this grade. 11. May the order crown the work, lend me of it`s wisdom in the work, and enable me to understand the great work. Thank the higher powers for their presence and the 4 Guardian Angels of the 4 cardinal directions for their protection and for being a witness unto your ceremony. Say : If there is any spirits or Entities around, may you depart in peace. The door between the worlds is now closed. The ritual is now finished. Notes : When doing the Lesser Banishing Ritual Of The Pentagram the Guardian Angels are facing outwards from your Magick circle ready to protect you. When doing the Lesser Invoking Ritual Of The Pentagram the Guardian Angels are facing inward from your Magick circle. My new Magick Mirror is now completed, after painting it black I decided to paint white writing around the 4 sides of it. 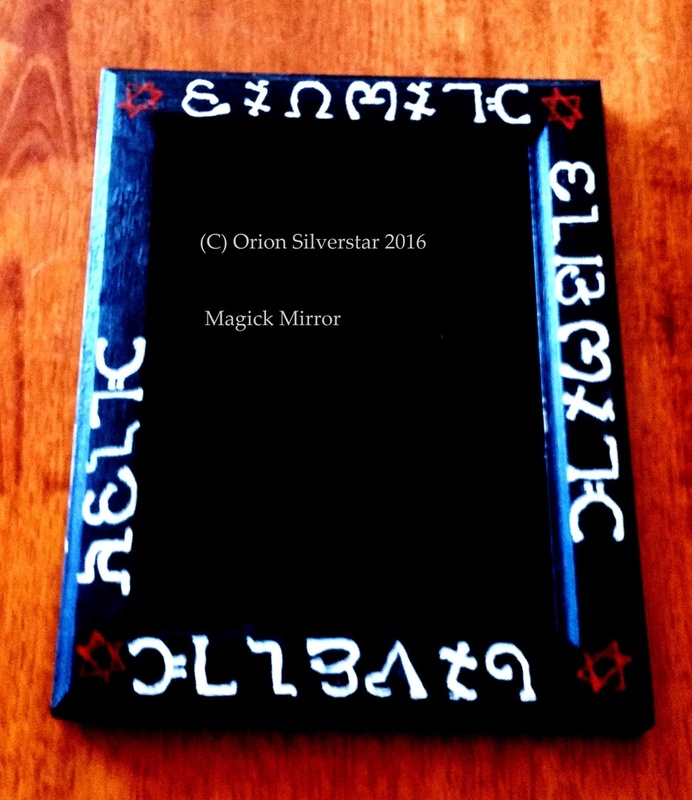 As the Magick Mirror works like a portal between the physical world and the spiritual words, it was necessary to have some form of protection with it. I chose to use the names of the 4 Guardian Angels, Raphael at the top, Michael to the right side, Gabriel at the bottom and Uriel on the left side. The writing I decided to use was the Enochian language, said to be the language of the Angels given to John Dee and Edward Kelley by the Angels themselves. 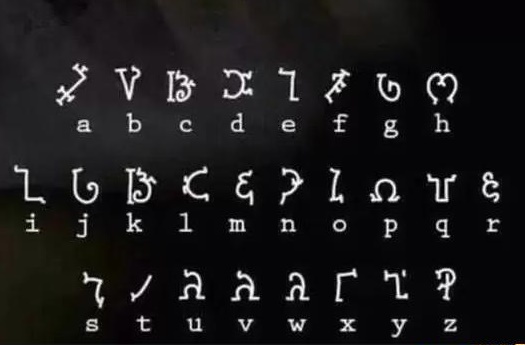 So by writing the Guardian Angels names in this language, it would make it all the more powerful. 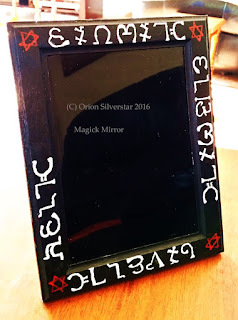 Lastly, I painted the mirror frame over with clear lacquer in order to preserve the writing for sometime to come. 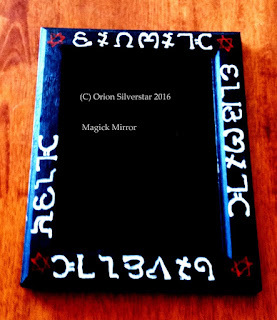 Feel free to use my ideas for your Magick Mirror, let me know how you go and of your results. Also if there is anything else I have mentioned here in this write up that you wish to know more about or unsure about. Please feel free to leave a message for me under this blog in the comments session.